Soon after Maj. Trey Birdwell became Cornell’s Army ROTC executive officer in 2014, he discovered a large collection of military artifacts dating to World War I, but he feared it wasn’t being stored correctly. Hundred-year-old uniforms were stuffed into trunks; others hung from hangers, exposed to sunlight. Historic photographs were silvering and sticking to their frames. “I didn’t know what to do with it, but I knew we needed help,” Birdwell says. He connected with then-University Archivist Elaine Engst, M.A. ’72, and Denise Green ’07, assistant professor in the College of Human Ecology’s Department of Fiber Science & Apparel Design (FSAD) and director of the Cornell Costume and Textile Collection. Their collaboration launched a yearlong, cross-departmental effort, including ROTC, FSAD and archivists and preservationists from Cornell University Library. 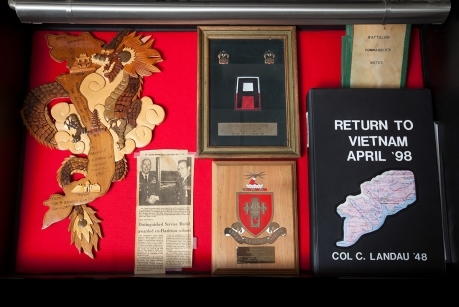 The team preserved and organized uniforms, correspondence, photographs, tactical manuals, rare books and other items – and in the process shed new light on Cornell’s long history of hosting the military on campus. The renovation of the Wortham Military Museum, on Barton’s third floor, is nearing completion. Displays honor prominent Cornellians who served in the armed forces, including Col. Frank A. Barton, Class of 1891, one of the first two Cornellians to earn a U.S. Army commission and the university’s first ROTC commander; and Brig. Gen. Robert I. Stack, who entered Cornell with the Class of 1920, best known for taking Nazi leader Hermann Goering into custody after World War II. As New York state’s land-grant university, Cornell for decades required all male students spend two years studying military tactics, and it has the only uninterrupted ROTC program in the Ivy League. The artifacts in Barton offer rich details and stories about generations of students who served their country with distinction, including Matt Urban ’41, a World War II Medal of Honor winner, and Edward Tinkham, Class of 1916, who organized a Cornell unit in the American Ambulance Field Service. The unit, which was commanded by Tinkham and arrived in France in April 1917 during World War I, was the first American fighting unit to carry the American flag to the front. Preserving the uniforms provides both a service to Cornell and a valuable learning experience for students, Green says. Catherine Blumenkamp, a graduate student in the field of apparel design, was working on the “150 Years of Cornell Student Fashion” exhibition a year ago when she came across a 1912 Cornell Cadet Corps uniform. She helped put together a small exhibit of five military uniforms for Charter Day Weekend in 2015. Jackie Fogarty ’18, a fashion design student, helped ROTC catalog, store and create a digital database for all its uniforms – and as she did so, she unearthed stories about the clothes and those who wore them. “Military uniforms are so complex – each and every detail has specific meaning,” Green says. “To read these garments was a very interesting educational task for our students. We know clothes are loaded with meaning and serve as communication devices in a lot of different ways, but it’s often very subtle. With these military uniforms, it’s very explicit – but you have to know how to read them. Some uniforms will remain on display at Barton, while others have been moved into storage – folded in acid-free boxes, protected from light. The museum also has been painted, and its windows and lights repaired, though some larger-scale work has yet to be completed. Photographs have been restored and preserved by library conservators, and framed reproductions are displayed in the museum. Archivists removed about 10 boxes of documents that have been cataloged and stored in temperature-controlled vaults in the library’s Division of Rare and Manuscript Collections.